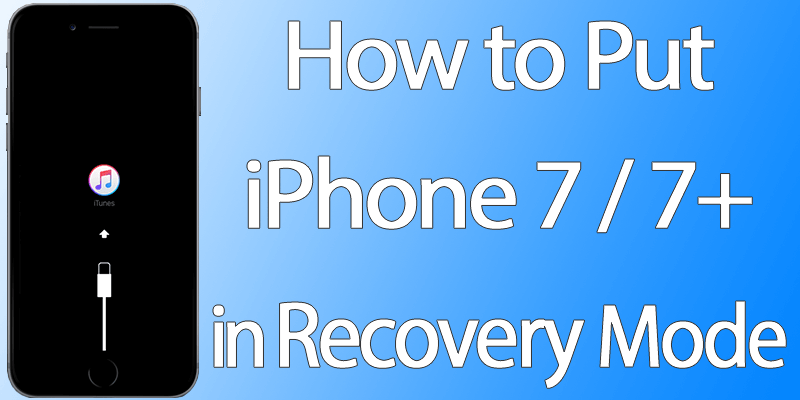 Are you wondering how to put iPhone 7 in recovery mode? This is the mode that comes in handy when iDevice owners restore or downgrade their iDevices. It is sometimes confused with the DFU mode, but the function is different. The DFU mode is just firmware update mode. Recovery mode is similar to it in the sense that how the phone behaves and how iTunes detects it. But the functioning of the recovery mode showcases the difference. When you know how to put iPhone 7 in recovery mode, you’ll understand that the iPhone is downgraded and restored in recovery mode only. Step 1: Make sure the latest version of iTunes is on your PC/Mac. Step 2: Use the USB lightning cable to connect the iPhone 7 Plus or iPhone 7 to the PC or Mac. Step 3: While holding the power/lock button, tap and hold the volume down button. It’s on your phone’s left side. Keep holding these two buttons for 10 sec. Step 4: Now you will see the Apple logo on the screen. Keep holding the buttons! Step 5: After few seconds, you will see the iTunes logo with lightning cable on the screen. This means that your iPhone 7 is now in Recovery mode. Now you can start the iOS restore or update procedure. 01Note: If the device is turned on again in normal mode, try the steps again. Both tools can be used to put your iPhone in Recovery mode if you have issues with the power or the volume button. You can download RecBoot or ReiBoot tool for your Windows 10/8/7 PC or Mac from our downloads page. After you download the tool, you need to install it on your Mac or Windows Computer. After the installation, connect your iPhone to the Computer and open ReiBoot/RecBoot tool. Wait for a while to detect your iPhone, then click on the “Enter Recovery Mode” button to put your iPhone into recovery mode. 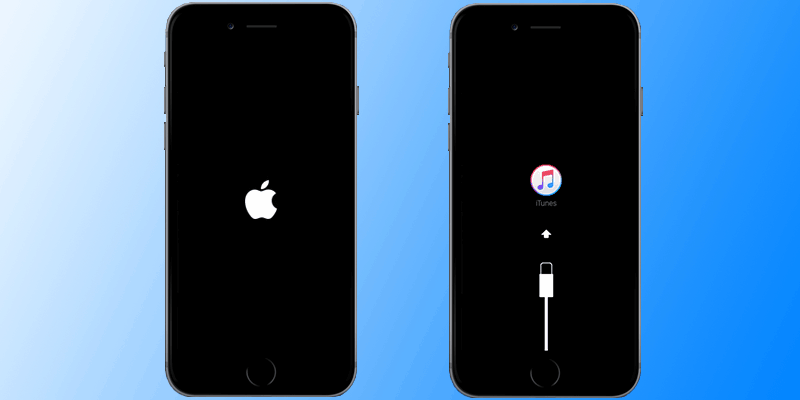 Now you can open iTunes – your device will be detected in recovery mode and it will be ready to be restored. To restore it, just click on the Restore iPhone button from the iTunes pane. Disconnect your device from the computer or remove the lightning cable. You should first tap and hold the Home and Power button for 15 seconds and then the screen will be blank. Then let go of the Home button and keep holding the Power button till the iPhone launches. 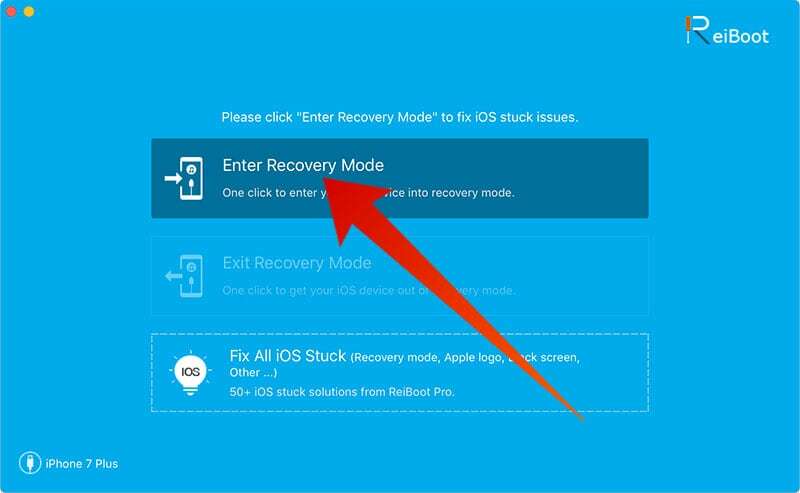 If your iPhone stuck in recovery mode, RecBoot or ReiBoot can be used to get your iPhone 7 out of recovery mode. Just you need to download and install one of the tools mentored above and click the “Exit Recovery” button. Now you iPhone will be rebooted in normal mode. If still can’t be restored, updated or downgraded, we recommend you to put it in DFU mode and restore it with the latest iOS software version. This guide is very helpful when your iPhone 7 is disabled, you forgot the passcode or you want to restore it for another reason. You must know that all of your data will be lost in this procedure. We recommend you to create a backup to keep your data safe.